Rail travel is the safest form of land transport in New Zealand, but occasionally train crashes occur. 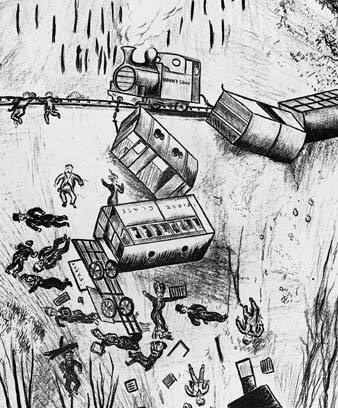 The worst rail accident happened on Christmas Eve 1953 at Tangiwai when a train plunged into a flooded river in the dark, and 151 people lost their lives. Rail transport in New Zealand is very safe, but there have been some dramatic train crashes. The highest rates of injuries and deaths from rail accidents were in the 1920s to 1940s – the peak years of rail travel. In the early 2000s level crossing accidents were a major problem. Motorists were often killed or injured when they ignored warning bells and signals. Mechanical failure: in 1899 four people were killed at Rakaia when one train plunged into another after its brakes failed. Track or signal problems: in 1981 speed warnings were missing on a curved stretch of track and a driver went too fast and derailed the Wellington–Auckland railcar, killing four people. Human error: a train driver derailed a train near Hyde in 1943, and killed 21 people. He was drunk at the time and driving the train too fast. Weather: in 1880 a train on the Remutaka incline was blown off the tracks in a gale and three people were killed. Heavy rain often brings down slips or landslides which can cause trains to derail. Trespassing: people straying onto rail tracks can be struck by trains and are often killed. The worst railway disaster was at Tangiwai near Waiōuru in the central North Island on Christmas Eve, 1953. A wall of water broke free from the crater lake on the top of Mt Ruapehu and rushed down the Whangaehu River, partially destroying the railway bridge. A few minutes later the Wellington–Auckland express train reached the damaged bridge. The driver of the train tried to stop, but the train ran onto the bridge which collapsed into the torrent. Despite the brave efforts of rescuers in the dark and dangerous conditions, 151 of the 285 people on the train died.